For Immediate Release: Posted On 9/21/2017 By Industrial Magnetics, Inc.
Industrial Magnetics, Inc. (IMI) is pleased to announce the advancement of company initiatives for industry and regulatory compliance with the recent addition of Compliance Engineer, Kenneth Gentner. Mr. Gentner is a licensed professional Engineer and a certified Quality Auditor, with HACCP certification from the International Alliance. He has successfully supported regulatory compliance for various industries including automotive, medical devices, and construction applications. His international engagements have included activity in Germany, Finland, Belgium, South Africa, and the Asian-Pacific. 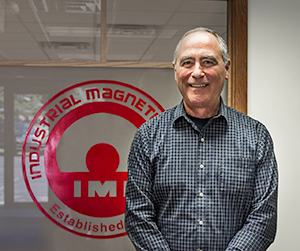 About IMI: Since 1961, Industrial Magnetics, Inc., has been an industry leader providing innovative permanent and electromagnetic solutions to meet the exact needs of any application. For additional information or to request a catalog, visit IMI online at http://www.magnetics.com or call 231.582.3100.